OBSERVATION POST SHRINE, Afghanistan – With a few minutes of downtime here in Kajaki, I wanted to touch base on something for the truck lovers out there. What you see above is a photograph of the vehicles the Afghan police drive while on duty. It’s a green Ford Ranger pickup truck, and they can be found across Helmand province. It’s no normal Ranger, however. The truck has four doors and operates on diesel fuel. If there are any similar trucks in the U.S., they are few and far between. 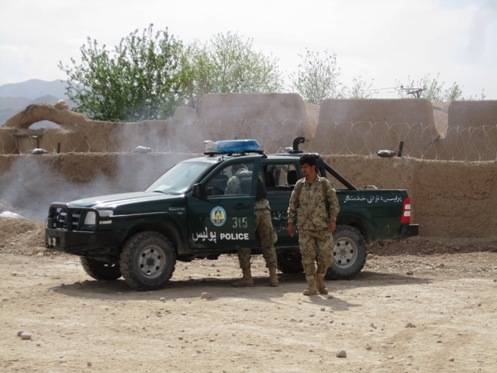 Marines jokingly call the trucks “Danger Rangers.” Considering the Afghan police are driving the same dirt roads and paths that U.S. personnel are in mine-resistant vehicles, it seems like a fair name. I wish Ford would make a quad cab, diesel Ranger available here in the U.S. If that were the case I would be driving a Ranger again. Was less than impressed with my 1992 Ranger V-6 Extended cab. Regional and OTR truck driving jobs. Class A CDL truck driving jobs and Non CDL truck driving jobs.